A multitude of Siouxland organizations will co-sponsor Entrepalooza, an eight-day celebration of entrepreneurial spirit in Siouxland. This year’s Entrepalooza takes place from Feb. 12 to 22. The celebration will kick off at 6:30 p.m., Monday, February 12 with a presentation local entrepreneurs titled, “Taking the Temperature of the Entrepreneurial Climate in Siouxland.” This presentation will explore what helped the speakers on their path to success and what else Siouxland needs to be a Startup Community. Panels speakers will include Beth Trejo, Chatterkick; Ryan Allen and Meghan Nelson, Lumin Therapy; Dave Winslow, Jackson Street Brewing; Ashley Prince, Pickle Palette; Sara Gotch, Gnarly Pepper; and Jim Braunschweig, Flickboards. The event will be hosted in the St. Francis Center on Briar Cliff’s campus. This event is organized by Briar Cliff’s Enactus team and sponsored by the Siouxland Economic Development Corporation. It is free and open to the public. For more information, contact Judy Thompson, advisor for BCU Enactus, at 712 279-5549 or judy.thompson@briarcliff.edu. On Tuesday, February 13, Entrepalooza will host a Google workshop, “Let’s Put Our Cities on the Map,” at the Lincoln Center on the Morningside College campus at 5:00 p.m. Pre-registration is required and the first 50 to register will receive a free dinner. To register, email millerta@morningside.edu. This event is sponsored by the Small Business Development Center, Morningside College’s Entrepreneurship Group, in addition to Google, Jimmy John’s, and Iowa’s West Coast Initiative. That same evening there will be the Sharks Boot Camp for Swimming with the Sharks finalists at Western Iowa Tech Community College at 6:30 p.m. The Small Business Development Center sponsors this event. For more information, contact Todd Rausch at 712-274-6454 or todd.rausch@witcc.edu. Love a Local has returned for this year’s Entrepalooza on Wednesday, Feb. 14. Similar to Small Business Saturday, Love a Local encourages Siouxland shoppers to buy their Valentine’s Day gift from a locally owned business. They can then take a selfie of themselves and post it on the Love a Local Facebook page for a chance to win $100. The small business where the winner’s purchase was made will also win $100. It begins February 1 and ends on Valentine’s Day. The small business must be located in Plymouth, Woodbury or Monona counties. Rules of the promotion are found on the Facebook page www.facebook.com/SiouxlandSmallBusiness/. Love a Local is co-sponsored by America’s SBDC Iowa at Western Iowa Tech Community College and the BCU Enactus team. On Thursday, February 15, a series of events will be hosted at the Sioux City Public Museum. At 3 p.m., the Innovation Grow Competition, presented by BCU Enactus and Sioux City Growth Organization (SCGO) will enable Siouxland high school students to pitch their business ideas to SCGO judges. The winning business receives cash awards. At 4:30 p.m. on Feb. 15, the Innovation Market, sponsored by SCGO, will follow. Entrepreneurs and business leaders are invited to attend the event. Young professionals are encouraged to submit business ideas that will benefit Siouxland. Innovation Market is a venue for entrepreneurs to showcase their ideas for businesses, community events and non-profits. For more information, contact Adrian Kolbo at adriankolbo@gmail.com. On Monday, February 19, Entrepalooza heads Makerspace at 1401 TriView for the Education Summit. “How to Make Our K-12 Students More Innovative,” will be presented at 6:30 p.m. Interested teachers, principals, superintendents and parents are invited to this event. This is sponsored by BCU Enactus and Makerspace. For area small businesses, the Siouxland Chamber of Commerce will host the Small Business Education Series on Tuesday, February 20. It will be held over the noon hour and open to the public. More details will be forthcoming. Entrepalooza makes a stop in Le Mars on Wednesday, February 21 for Ice Cream Cocktails and Biz Tales. 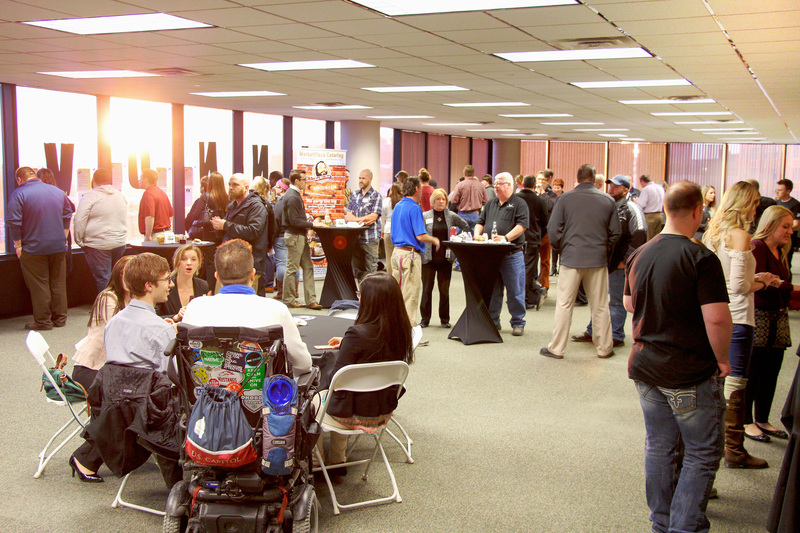 From 5 p.m. to 7 p.m. at P’s Pizza House, attendees will have a chance to network and brain-pick fellow entrepreneurs from Siouxland while treating yourself to ice cream cocktails in the Ice Cream Capital of the World®. For more information, contact Neal Adler at neal@lemarschamber.org. Entrepalooza continues on Thursday, February 22. Briar Cliff’s Enactus team will host the annual “Swimming with the Sharks” competition. Presentations and judging for the contest will begin at 6:30 pm at Briar Cliff’s St. Francis Center. Finalists will vie for mini-grants valued up to $4,000. For contest rules and applications, visit briarcliff.edu/sharks. Applications for grants are open now and end on February 7. Entrepalooza partners include: Briar Cliff University Enactus, Siouxland Economic Development Corporation, Small Business Development Center, Iowa’s West Coast Initiative, SCORE, Sioux City Growth Organization, Northeast Community College, Morningside College, Western Iowa Tech Community College, Springboard Morningside College, Springboard Co-working, Siouxland Chamber of Commerce, South Sioux City Chamber of Commerce, Sioux City Economic Development, South Sioux City Economic Development, North Sioux City Economic Development, and Woodbury County Rural Economic Development, LegitDesigns, Startup Sioux City, Le Mars Chamber of Commerce, Sioux City Community Schools. Other Entrepalooza-related events include Venture School, which will start on Monday, February 26 (contact John Engel at jpengel2@gmail.com) and Northeast Community College’s Enactus team’s Jumpstart Market at the South Sioux Chamber’s Coffee Hour. It will be held on March 16 at 9:30 a.m. at the College Center. For more information on any of the events above, visit www.facebook.com/SCEntrepalooza.